Take 91 South through Hartford. Take the Route 5/15 South Exit. Take Exit 85 off of 5/15 onto Route 99 in Wethersfield (this puts you on Rt. 99 going south). Go approx. 1/3 mile and take a right Church Street. Take first left onto Church Place. Park in the Silas Deane Middle School parking lot at the end on the right. The field is to the right. Take 91 North towards Hartford. Take Exit 24 off of 91 North. Take a Right off of the exit onto Route 99 North. Follow for approx. 2.5 miles. Go approx. 2 miles and take a left onto Church Street. **Big Deane Field is the larger field behind (and closer to) Silas Deane Middle School. You may park in the parking lot at the end of Church Place behind Silas Deane Middle School. Charles Wright School is on the right (approximately 300 feet). School is on the right (approximately 300 feet). Take second left onto Wolcott Hill Road. Wethersfield High School is 1/4 mi. on right. The field is behind the school to the right. Take Exit 24 and bear right onto the Silas Deane Highway. At the 8th set of lights, take a left onto Wells Road. At the first light, take a right onto Wolcott Hill Road. School is one-quarter mile up on the left. **Big Cottone Field is the football/soccer field, not the one inside the track. Little Cottone is the smaller field behind Big Cottone Field (past the baseball and softball fields). PLEASE NOTE THERE IS NO PARKING, DROP-OFFS OR PICK-UPS ON SIDE STREETS (WESTWAY OR CHURCH STREET) CARS WILL BE TICKETED. YOU MUST PARK IN THE HIGH SCHOOL PARKING LOTS. This is a synthetic turf field, players can wear turf shoes or cleats. **Little Deane Field is the smaller field behind Silas Deane Middle School. Most people park on Darwell Drive, but there is a parking lot at the end of Church Place behind Silas Deane Middle School. Take Exit 28 to Route 5 and 15 (Berlin Turnpike Wethersfield - Newington). Take Exit 85 (Route 99 South Wethersfield - Rocky Hill). At 3rd traffic light (Nott Street) take a right. Go straight to 1st stop sign and take a left onto Wolcott Hill Road. Follow road all the way to end to Prospect Street until you come to a stop light. Mill Woods Park is across the intersection. Take a quick left and then a right into the park. Drive about 200 yards and park near the tennis courts on your left (just before the beach/pool which will be to the right). The field is directly behind these tennis courts and may be accessed on the right side of the courts. Take Exit 24 (Route 99 - Silas Deane Highway). Bear right on exit ramp onto Silas Deane Highway North (Route 99) into Wethersfield. Continue north on Silas Deane Highway to Maple Street (Route 3). Take a left onto Maple Street and then right onto Prospect Street at traffic light. Continue on Prospect to the 1st stop light. Mill Woods Park is on the left. **Cottone Field is the football/soccer field, not the one inside the track. *Please note that the field is directly behind the school (access via the right side of the school) and not visible from the lots or road. Take Exit 26 (Old Wethersfield). At stop sign at end of ramp turn left. At next stop sign turn left. At end of road turn left onto Marsh Street (curves to the right). At next stop sign turn right onto Main Street. At second left turn onto State Street and proceed past Department of Motor Vehicles on right. Cove Park is on right. At stop sign at end of ramp turn right. Take quick left onto Marsh Street (curves to the right). At next stop sign turn right onto Main Stret. Cove Park Field is adjacent to the Wethersfield Department of Motor Vehicles. Take Exit 28 (Wethersfield) and continue south. Take Exit 85 (Wethersfield/Rocky Hill - 99 S). The exit ramp will merge into 99 S.
Immediately get into far left lane. Turn left at light onto Jordan Lane. At stop sign turn right onto Hartford Avenue. Bear left onto State Street after the Solomon Welles House. Cove Park is on left. Turn right onto Wolcott Hill Road in about .25 miles. DiCicco Field is the grass soccer field inside the track. Drive about 200 yards and turn right at tennis courts (so that beach/pool is on left). Travel Fields are up to the right behind the softball fields. 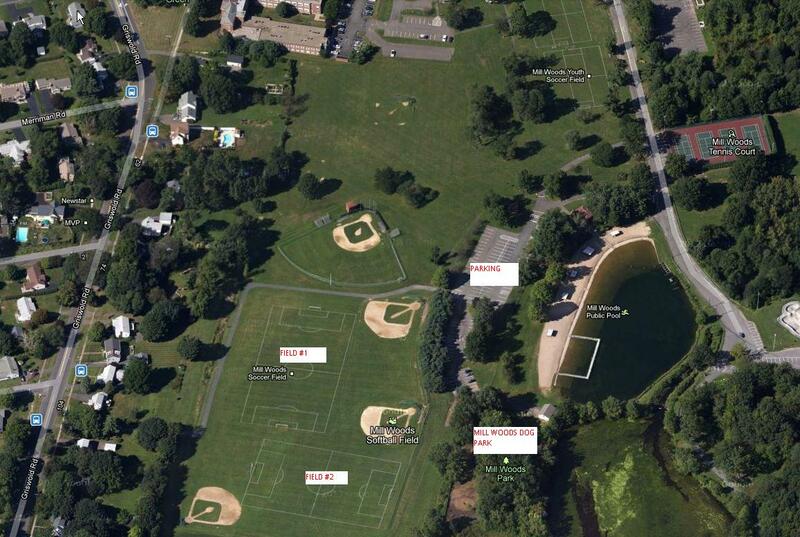 **Dogs are not allowed on the fields, HOWEVER, the Wethersfield Dog Park is in Mill Woods Park. Upper Mill Woods Fields are natural grass fields.